You can see a little bit of a work ticket, sneaking into this picture. A work ticket, is a menu of choices that helps guide the children through their academic work each day. The ticket includes a section for reading, word work, math, science/geography, workbook and choice. There are many activities for each area that the children are free to choose from each day, but they are required to complete one work from each daily. The child above is reading an easy reader. We have leveled readers ranging from the Kindergarten level to the the third grade level, along with many trade books that the children can choose to read from. A couple of times a week each child and I sit down together and look over what they have been reading and read together! The children also bring books home from from the Minot Sleeper Library and have printable decodable books that they practice phonics and high freequency word skills in. 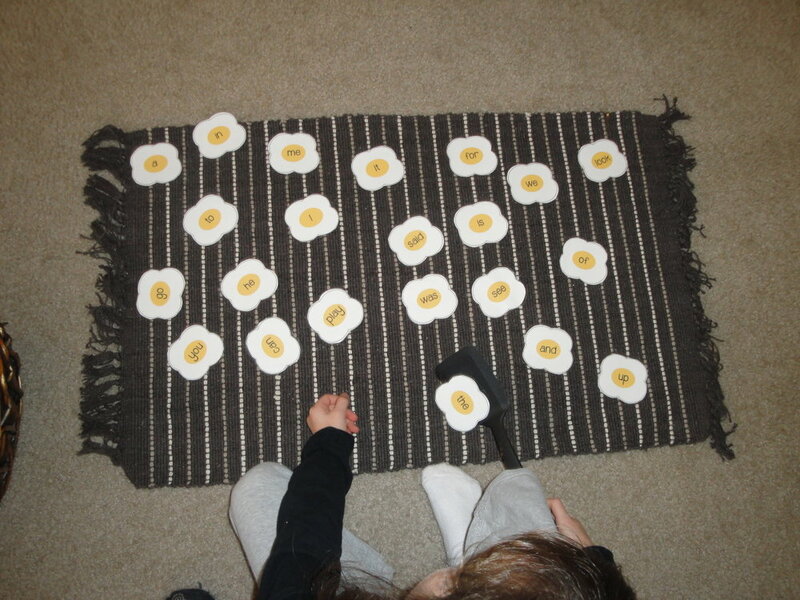 High frequency word egg flip! This child is working on the word work section of their work ticket, flipping sight words! Here is another word work activity, matching printed upper case letters with their lower case letter stamps. These girls are playing sight word go fish! Card games seem to be among the children's favorite activities. I love sight word go fish because it lends itself so naturally to differentiation. If the child does not know the words yet, they can still have exposure to the words by looking for beginning sounds, or having the other child show them the word so they can check their cards for a match. With time, they all learn these words in the absence of drill! This child is working on sound drawers. Thirty-one drawers guide children through phonics lessons. Each drawer has controlled letters so that children who have just begun reading can successfully read and move on to more difficult patterns such as long vowels and diagraphs. These cards also are easily differentiated as the first few drawers can easily be sorted by simply recognizing beginning or ending sounds. Workbook is my least favorite work of the day, but something I feel the children must have exposure to for when they leave us. So many programs are workbook/worksheet rich that I feel like our children need to have a preview to this. A solution to this is asking that they do two pages of workbook practice each day. This is just a small example of the the language works which are out on our shelves. Stay tuned for more examples of math and science work.